We at Opinions You Should Have are very sad to see Donald Rumsfeld -- the perfect satiric target -- leave the Pentagon for greener pastures. We have mentioned Secretary Rumsfeld many times on these pixeled pages. Below, some of our favorites. 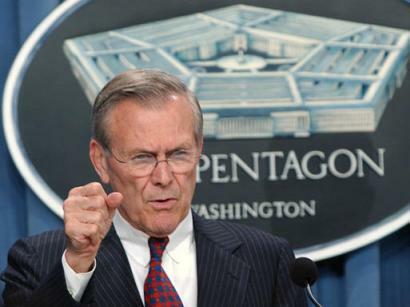 In a stunning display of his supremacy over the media, Secretary of Defense Donald Rumsfeld crushed the left testicle of a reporter as his sole response to what he later said was "an annoying, time-wasting, meaningless question." The reporter, Daniel Kingsly of The Sacramento Sludge, later said, in tones several octaves higher than usual, that "these are the risks you take as a pool reporter when you ask a question that maybe you shouldn't have." That morning's press conference started normally. The Secretary took some simple questions regarding the number of troops stationed in and whether Rumsfeld was pleased that the POWs had returned home vefore he called upon Kingsly. There was a pause before Secretary Rumsfeld suddenly reached into the press pool, ripped Kingsly's testicle from his body, crushed it, and held it up for the rest of the press pool to see. "Ok?" said Rumsfeld. "Any more smart-alecky questions?" He later told the press pool, "Don't think I can't get to an ovary if I have to." Original story published in slightly different form on April 22, 2003..
Rumsfeld Inadvertently Sent To Comfort Tsunami Victims, part of something I originally wrote for the New York Times. Today Rumsfeld Rums-fled. We will remember him. Whether we want to or not.